Whether it’s something you want to acknowledge or not, there exists a culture of tattoos in the sport of swimming. 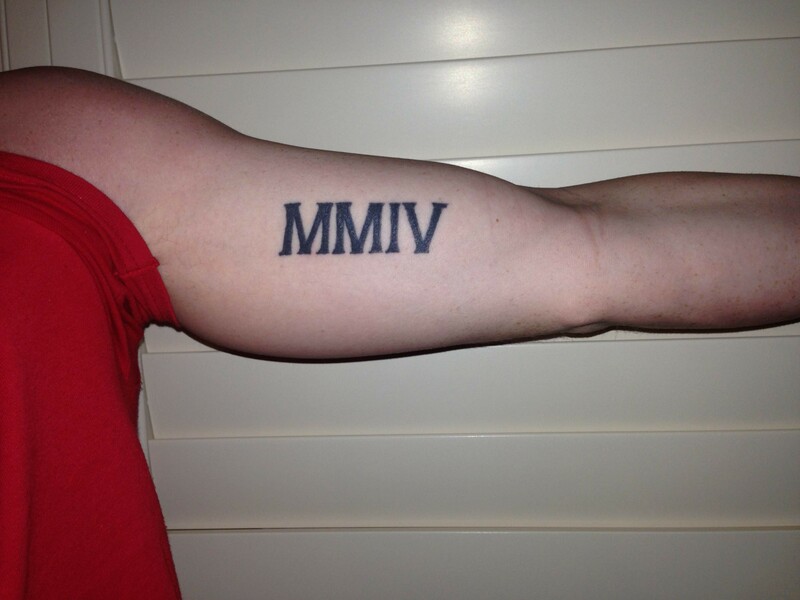 Unlike other sports, it is almost impossible (unless you are pretty creative) to hide a tattoo. Since we stretch, train, and compete with minimal amounts of clothing, what we put on our bodies becomes a symbol of who we are and what we want the world to know about us. With swimming in particular, there is extra significance to what appears on our skin, since we cannot hide what we put on our bodies. Permanent markings allow swimmers to share with the world their philosophies, their personalities, and their competitiveness. 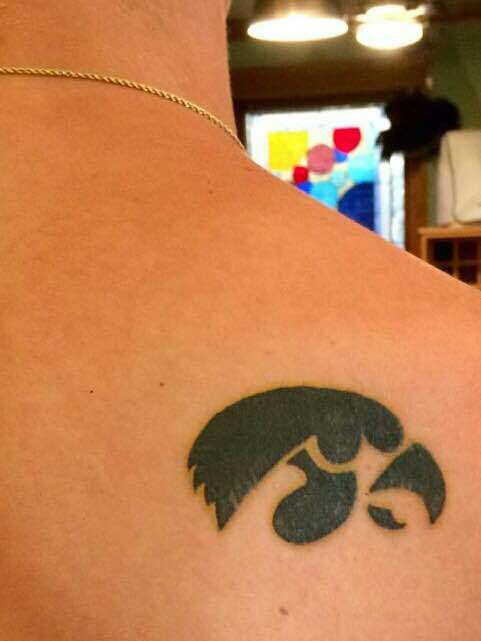 Nicholas Petersen, a sophomore at Northwestern University, has three tattoos. Two of the three are on his hips which are usually covered by a drag suit or a fast skin. 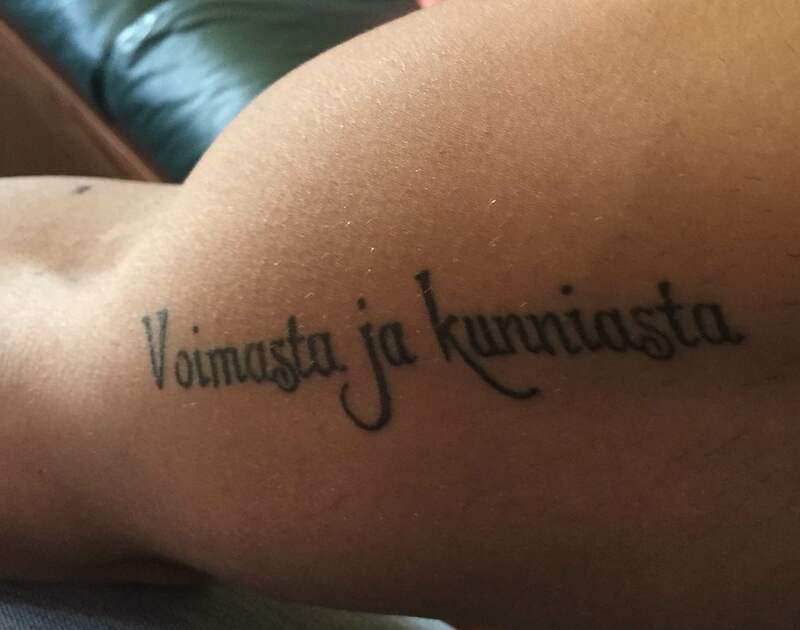 However, the most visible permanent mark is located on his right bicep, “Voimasta Ja Kunniasta” or “Strength and Honor” in Finnish. In swimming you have to be strong and put in tremendous amounts of work. Having a reminder is what humbles some and allows them to carry on. Finding the different ways to stay engaged and focused on goals is what makes sport so interesting. When you permanently mark your skin in such a visible spot, you see it all the time and its always there. It serves as an articulation of one’s philosophy and personality as a swimmer. “I am lucky to see it all the time. In terms of competition, it reminds me to go out and have fun. Other than being a reminder of why I started and continue to swim, it beckons to me to push through hard times both in and out of the pool,” Clifton said. 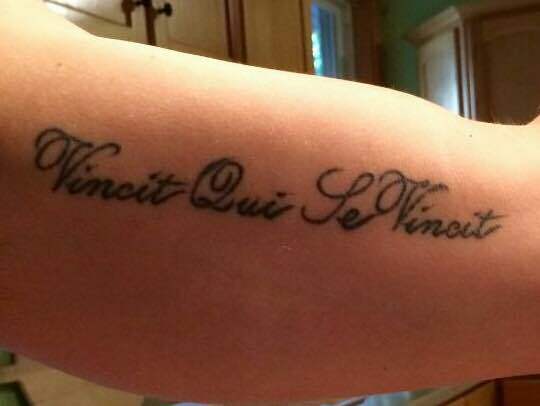 Even though Latin quotes are somewhat common, it shows understanding and forethought when put to use with the knowledge of conjugations and declensions. It also serves as a reminder through the hard times. 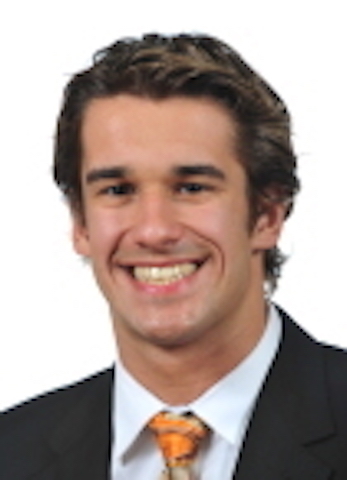 “I got it after freshman year after not making the Big Ten squad. Getting the quote helped me keep my head up and reminds me to do so what the going get tough,” Patnode said. The other tattoo is worn on Patnode’s back and is of the iconic Hawkeye. Tattoos are found everywhere and carry different meanings. For swimmers, by the virtue of our “uniform” the act of marking ourselves speaks volumes to who we are and what we are made of. Whether it be a philosophy of pushing through the hard times, a comment on the personalities that carry the ink, or the subtle reminders of competition confidence, the tattoo culture in swimming is not going to vanish anytime soon. It starts with the Sharpie…. It should say Swimming AND DIVING! Is it true you can’t swim in the Olympics if you have a tattoo? Oh thank you! My son is a national swimmer and competed last week for 5 days 🙂 he is a breaststroker and backstroker. I’ll show him this post. He’ll be stoked!! He turns 16 on Friday and is 6’3 lol. My son was a swimmer and has two tattoos on his back. I always said to him that he could only put them where they did not show out of his clothes as one day he will be in the Corporate world and you cannot have tattoos showing everywhere. His are very tastefully done. Pushing “Not Like..” Ugly. Sad. Not a good roll model for kids. Just sayn’???? I know…I have grand kids swimming. I have a tat. Mine was being in ’84 Olympics. I’m kinda with it;-). Just not wanting the total body paint. You’re absolutely right that people with tattoos are bad role models for kids. I mean all people with tattoos are bad people ? Just remember it’s forever Al! “culture” retrograde seems to me. Although, every one have the right to express the way it likes. I’ve always preferred to wear mine on the inside, but if that’s what it takes to keep yourself motivated, knock yourself out!! Swimmers bodies have to be the best looking in the sporting world. Why spoil them. Just saying…..that’s all ? So being old, female, and having a traditional tattoo doesn’t help in some circumstances. Traditional tattoos were the whole point of the ban.